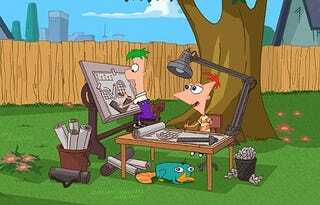 Hey Ferb, I know what we're gonna do today! These guys know how to do summer vacation right. They've built rockets, fought a mummy, climbed the Eiffel Tower, painted a continent, created nanobots, and given a monkey a shower! Kids, if you're bored at home inside during the summer, go outside and take a page from these guys.